A fun day out for the whole family that will be remembered for a lifetime. Explore the headwaters of the Waitemata Harbour as you paddle to the historic Riverhead Tavern. Just 31 km from central Auckland, Riverhead grew from the boom of the 19th century Kauri-gum and logging industry and was once the gateway to the north operating as the Auckland terminus of the railway. This journey culminates at the historic Riverhead Tavern. 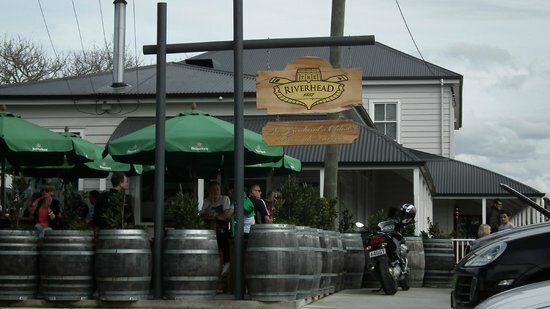 Thought to be New Zealand’s oldest riverside pub, the Riverhead Tavern holds NZ’s second oldest liquor license. Steeped in local history it is the perfect place to wet your whistle at the end of a paddle. Allow two to three hours for this kayak tour. The trip starts at Herald Island and finishes at the Riverhead tavern. We recommend a change of clothes be brought, to change into at the Riverhead Tavern. Transport back to Herald island can be arranged. All kayaking equipment is supplied, you’ll just need some clothes to paddle in and a camera. Warm clothes, thermals, fleeces etc – avoid wearing cotton. My favourite, kayaking and a refreshing drink! Lovely tour, thanks guys! Peaceful kayak, I enjoyed this tour very much. Thanks to Akari for making this an enjoyable experience. Please contact Canoe & Kayak Ltd if you are in any doubt as to whether it will be running.